It looks very much like the vismig (visible bird migration) season could well be over for another year, or that's how it looks to me at the moment! Any birds is great! although perhaps numbers have been down if we take into consideration past years records and notes for comparisons. And following on it's probably a good job we have got these records to show these changes. The Thrush Push - Little happened this year with just a flurry of the Fieldfare peaking here between the 20th and 22nd October with counts of 3165 and 3007 respectively over a approx four hour period. The Redwing as is usual (but not always the case) a little earlier with the main activity this year on the 9th October when I had 2586 over a four hour period. I also had yet another reasonable count of 1602 two days later on the 11th October. As each recent year goes by it's as though "a cataract is forming and just keeps on growing year by year". Gone seem the days when I got many more thousands of grouped thrushes making them special peak day offerings, when you could expect any numbers between five or ten or even teens of thousands to appear along those long established well chosen ancient corridors which for us usually (but not always) come up from the direction of the Aire Gap and progressed West/North West up towards the Lyth Valley where they established themselves for a few days feeding up before they secretly move off! The Chaffinch - Our area is without any doubt superb for the onward passage of Chaffinch and to a far lesser Goldfinch to which seem to come from several different lines from the West/North and North East. One line comes in as though following the motorway and then crosses over Burton whilst keeping heading to a South East at points between Dalton Hall and Priest Hutton, another main route and the one I tend to watch more regularly appears to come from the direction of the Lyth Valley and Whitbarrow, then continues above and over Vicarage Lane and joins up also with birds coming across from Curwen Wood, Lancelot Clark Storth onward over the Dalton Hall Estate to probably Capernwray and maybe Arkholme and onward. Another line follows the East side of Farleton and Hutton Roof and will then make a lift near to the point of reaching Kelker. The birds then seem to cross over points of Uberash and almost to the point where the Trig Point lies before going onward in a Capernwray direction. I have spent lots of time observing this line from a point near the summit close to Whin Yeates. . The following records are purely from Chaffinch counts made of the birds that directly fly over the Vicarage Lane Area. Going back three years to 2014 I had some superb counts from near Vicarage Lane, Burton in Kendal when on peak days I had eg: October 9th 1310 birds (over 6 hours), October 10th 1351 birds (over 6hrs), October 18th 1022 birds (over 4 hours) and a later secondary peak on October 25th 1079 birds over 4 hours). Totals from that watchpoint for the full time observing (Sept 10th to Nov 3rd 2014) was as follows: 15,955 (Fifteen thousand nine hundred and fifty five birds) over 130 hours watching. Now then 2015 varies a lot because quite a lot of the time I was watching odd days from a different site, however it was still noticed that from the times I was at the Vicarage Lane site (the main peak period), the counts were very low in comparative to what I had in 2014 eg: The only peak days I had were October 11th 121 birds (over 3 hours, October 15th 133 birds (over 3 1/2 hours) October 16th 118 birds (over 3 hours), October 17th 104 birds (over 7 hours) and a later secondary peak on 31st October with 122 birds (over 4 hours). Totals from that same watchpoint for the full time observing (Intermediate dates between Sept 10th to Nov 3rd 2015) was as follows: 1,397 (One thousand three hundred and ninety seven birds) over a 68 hours watching. Although dividing my time counting from another site as well. I did spend all the peak period Oct 4th to 31st) counting from this same (Vicarage Lane) site although with lesser hours, yet the numbers had dropped staggeringly low in comparison to 2014. During 2016 I have maintained the same watch site and the numbers have been as follows for the peaks. September 21st 314 birds (over 3 1/2 hours), September 26th 841 (over 4 1/2hours), September 30th 355 (over 4 hours) and more peaks Oct 1st 621 birds (over 2 3/4 hours), Oct 2nd 528 birds over 3 3/4hours, and Oct 3rd 713 birds (over 4hrs) a much later peak presented itself on Oct 15th 698 birds (over 2hrs) and finally Oct 16th 683 birds (over 2 1/2hours) - Totals from the same watchpoint for the full time observing (Sept 10th to Nov 3rd 2016) was as follows: 12,577 (Twelve thousand five hundred and 77 birds) over a 138 hour watching period. I was at first alarmed by the decrease in Chaffinch between 2014 and 2015, but now having done the 2016 counts I am more happy that numbers are not so bad after all. Things are just about (slowly) getting back to normal and I have paid several visits up to the Trig Point in particular searching for the Great Grey Shrike, but to no avail at the moment (10th November 2016), although no Shrike, Its been great to have a report from Robert Ashworth who had a party of four Waxwings crossing over Dalton and Lancelot last Saturday. There were hundreds of thrushes present (mainly in Dalton Crags) but these seem to have moved on at the moment. Also had the regular two Stonechats (paired) who seem to like overwintering in Dalton Crags, odd Snipe being flushed on the Common. 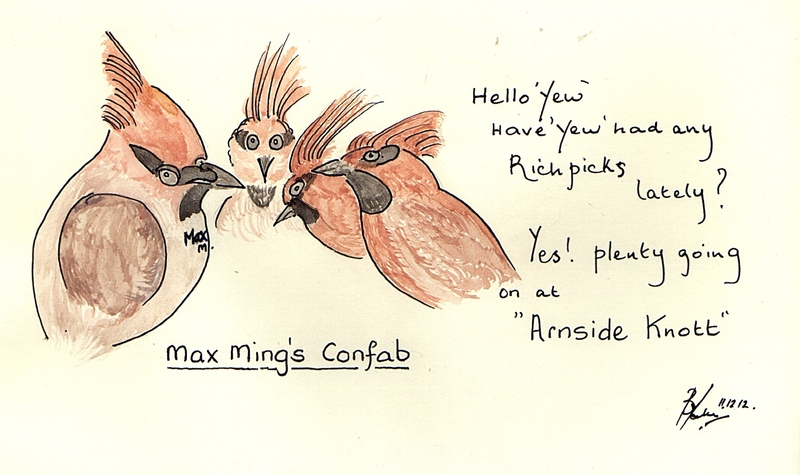 I had forgot all about Max Ming, must have done this about ten years ago! THERE WAS PLENTY GOING ON AT ARNSIDE KNOTT BACK IN 2012 but I have not heard of any around there yet!